As we continue renovations to upgrade the shared amenities here at ORA we’re happy to offer up work share residencies from late October 2018 to early April 2019. These zero fee self guided residencies are best suited to those interested in an hour or two work per day to help maintain the space. The main duties consist of managing the outdoor wood furnace, some snow removal, placing waste and recycling at the curb, or if you feel there is project you can contribute we’re happy to consider proposals. Interested folks should be able to spend a week minimum to 3 months maximum, lift 40lbs, comfortable tending a fire, enjoy rural settings, and give a no more than 300 word description of the art project you wish to focus on during your residency. Apply by sending an email to owlridgeacres@gmail.com with your contact info, dates you would like to request for your stay, project description and a subject line that says “Fall18/Winter19 Work Share“. Accepted residents stay in a private room with full use of the common areas (kitchen+equipment, laundry, bathrooms, living/dining room), bedding and towel provided. They also receive a hands-on tutorial on how to run the daily systems of the property, how to manage the wood furnace heating, how to work the back-up electrical in the event of a major power outage, how to conserve water and separate recycling. Beyond minimal daily chores and the time you have for art projects, the property offers a few kms of hiking/snowshoe trails with beautiful views to enjoy. There are also many Provincial Parks close by for day trips that offer hiking, snowshoeing and cross-country skiing. Bancroft is a well serviced town with a few grocery, department, hardware stores, lots of local shops and restaurants. If you’ve read this far and feel like some time away in a rural setting to focus on a project is the perfect thing for you this fall/winter, but aren’t completely sure what a wood furnace is I’ve shared a link below. As the cicadas buzz high up in the trees signaling the half way point to summer we’re reminded that it’s time for a little update. Thinking back to the end of winter and that precious/sweet sap season, it seems like so long ago that we were mumbling the words “will this winter ever end?”. But much like the sap season all good things do come to an end and the seasons change almost right before your eyes. Spring burst into life with beautiful apple blossoms, tulips, lady slippers and a new crop of vegetables to look after. It also brought us a very special house concert with the musically talented local Ian Russel. As the evening sun poured into the room the cords and rhythms from Ian’s guitar satisfied our thirsty ears. Add in some oyster shucking and a blazing bonfire to top of a wonderful night, it’s always a treat to open the living room to musicians and share the space here at ORA with great people. Which brings us to our last update, we’re happy to announce that Rube & Rake are returning for a second show this August. It’ll be an early show followed by a bonfire, unless we still have a fire ban and then we have to settle for a good old kitchen party. Rube & Rake are a folk/roots duo based out of St. John’s, NL, with a primary focus on creating sparse, stripped down songs. While many performers often look to expand their arrangements, the duo has found the opposite works best for them, allowing their harmonies and delivery of lyrics to come to the forefront. The two members, Josh Sandu (vocals/guitar/banjo) and Andrew Laite (vocals/guitar), have been honing their craft for four years, starting with a two-month cross-Canada tour in 2014. Having released their debut album “Back and Forth” in November 2017, they’ve had a busy start to 2018. Having toured in the winter, spring, and summer, a recent appearance on CBC television as a feature artist on “Absolutely Canadian”, playing multiple summer festivals in Newfoundland and Labrador and beyond, they’ve curated an evening of music and storytelling worth seeing. As always, feel free to bring your own adult beverages, non-alcoholic beverages will be available. This February end your family day weekend with a bonfire and house concert featuring Rube & Rake. Coming to us all the way from St. John’s, Newfoundland, Josh Sandu and Andrew Laite are a folk/roots duo that have played across Canada over the last 4 years. Rube & Rake craft and sing mournful traveler’s songs in a vocal style reminiscent of The Everly Brothers or Simon & Garfunkel, usually accompanying themselves with a banjo and acoustic guitar. Their harmonies and lyrics have caught the attention of the CBC and have been featured on CBC’s Absolutely Canadian, view that episode and other video below. Cash payment at the door will also be accepted. Light snacks, hot and cold beverages provided, but feel free to bring your own adult beverages. Looking back on the past year at Owl Ridge Acres gives us a lot of joy, its been quite a special year. From guiding hikes through the woods to experience The Great Canadian Tree Warmer installation to intimate heart warming concerts while gathering in the living room, 2016 is full of happy memories. But there is an event in particular that really strikes a chord with us. One warm August night a small group of folks gathered around a bonfire under a star filled sky to experience a slice of Canadian history in the making. The Tragically Hip performed their last show and with the help of the CBC we were able to take in the moment while projecting it on a white sheet hung on the side of our barn. Although it probably wasn’t as good as actually seeing the show in Kingston, I’m positive everyone that attended will remember exactly where they were that night. Thank you for the memories. We’d also like to extend a heart-felt Thank You to all the artists, musicians, writers, creative folk and their appreciators that made 2016 a great year for us. May 2017 bring you new creative energy and have you wandering into valuable new experiences. As we enjoy the remaining weeks of summer, taking in the moments like lake swims, picnic gatherings and exploration hikes. 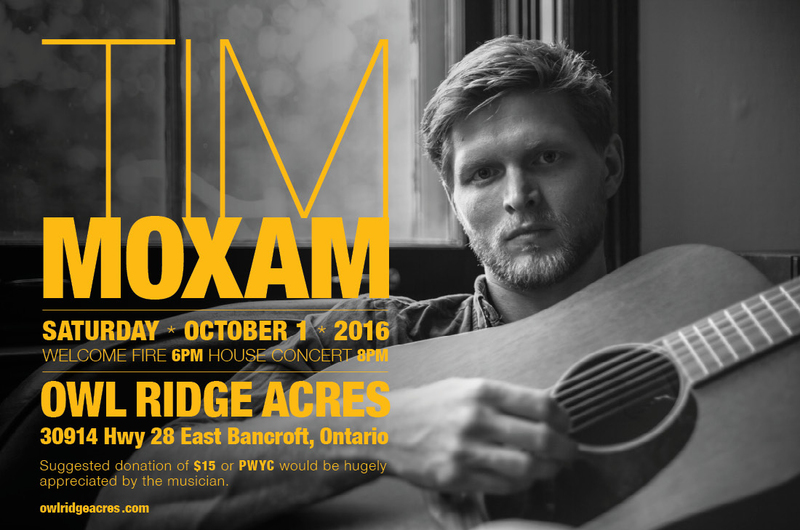 We’d like to invite you to celebrate the passing season and welcome autumn with a bonfire and house concert featuring Tim Moxam. Tim is a Toronto based singer/songwriter, currently touring to support his debut album Soft Summer. No stranger to Bancroft or North Hastings, Tim has local roots spending many seasons at his family’s cottage in the area. Since the release of Soft Summer the album has gained attention from CBC Radio 2 and favourable reviews from Exclaim Magazine. Tim has played numerous shows and shared the stage with such acts as Coeur de Pirate, The Strumbellas, Brad Roberts of Crash Test Dummies, and most recently the Peterborough Folk Fest, the but we hope that our show will be one of the most intimate. A suggested donation of $15 or PWYC would be hugely appreciated by the musician. 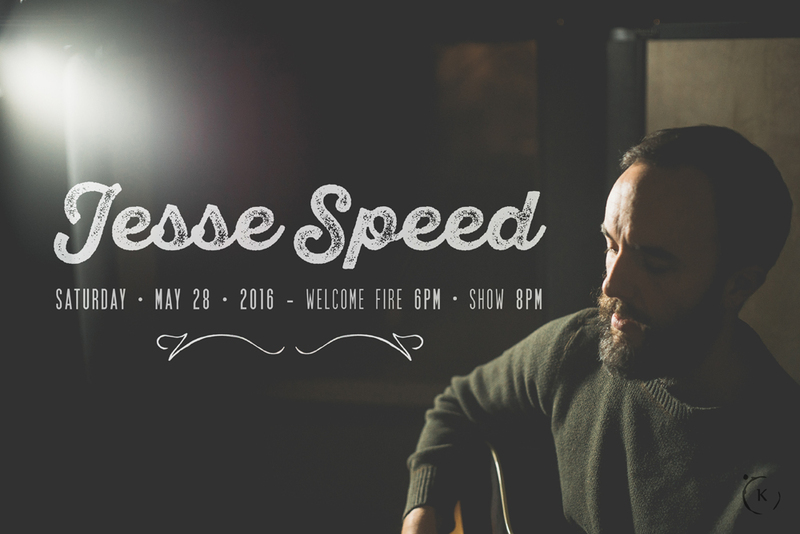 Jesse Speed – his real name – is a Montreal based singer-songwriter who is originally from the rural township of Hinchinbrooke in the South-West of Quebec. He submersed himself in songwriting after an ultra-conventional 9 to 5 job made him question his beliefs and focus on what became truly important to him. His sound has been compared to American folk artists Bonnie Prince Billy, Iron and Wine and Father John Misty. His lyrics are bleak yet present a clearly liberating thread of articulations about the archetypes of modern life. His debut EP Shepherd’s Call shines with its raw and minimalist sound, making it perfectly transposable to the stage for a strikingly honest performance. Jesse has performed at Folk Alliance 2015 in Kansas City, the Montreal Folk Festival and the renowned emerging arts festival Zone Homa. He has opened for Safia Nolin, Tire le coyote and Jordan Officer. With a long list of shows in Montreal and the surrounding regions of Quebec, his catalogue of collaborations includes many artists like Megan Nash, Daniel Isaiah and Old Cabin.